Save $100 with the ComPilotII and RemoteMic Bundle! A neck loop is connected to hang the ComPilot II for up to 24 hours of streaming using the phone option. With the neck loop removed ComPilot becomes a remote control for your hearing aids and easily fits in your pocket. The ComPilot II includes voice enabled Caller ID alerts. 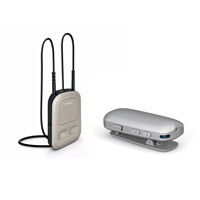 Use with the RemoteMic to stream conversations at a distance to your compatible hearing aids.